Lemons, lemons everywhere! At least that's what it seems during the 19 fun-filled days of Menton's annual Fête du Citron or Lemon Festival. 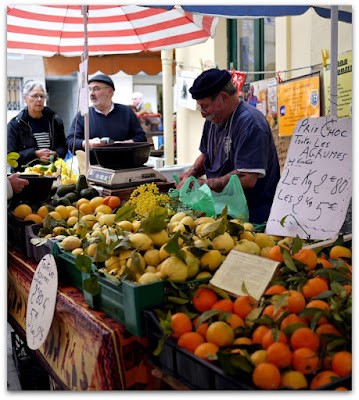 I got caught up in the lemon frenzy this Sunday when I bought a big bag of lemons from the Menton market and then poked through my recipes for a lemon dessert that could be made by anyone, including my dear friend Puddy, who never believes me when I say that something I served her was easy to make. This pudding is magic. During baking, it separates into two layers. 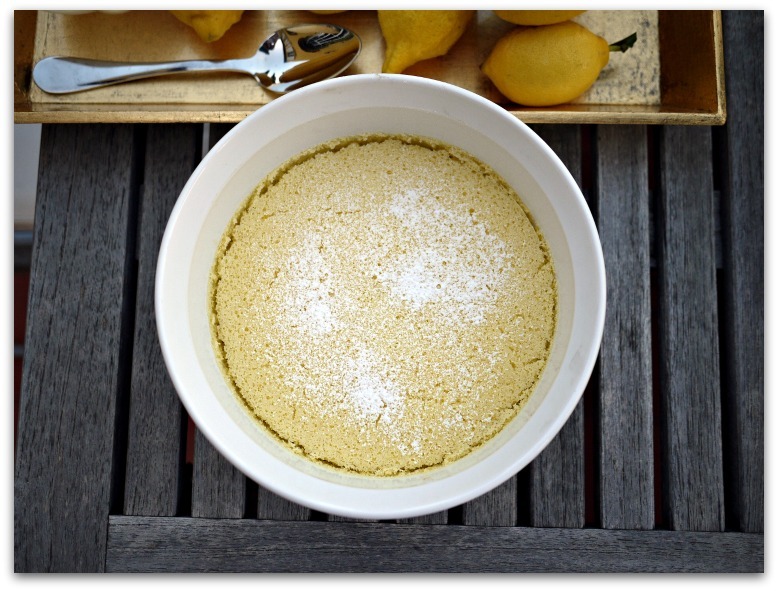 The top becomes a lighter than air sponge cake and underneath is a luscious lemon curd. It's fabulous served warm or cold but I think warm is better. I found the recipe in my late mother's recipe collection. For the life of me, I can't remember her ever having made it but there it was, mixed in with all of her other fruit dessert recipes. Since finding it, I've made it often at home, for my Seniors' baking group, and given it out to friends who often ask for it. It always get rave reviews. The last time I made it was for lunch during our annual Olive Harvest Party and It was devoured minutes after I set it on the table. Puddy, this pudding is for you! 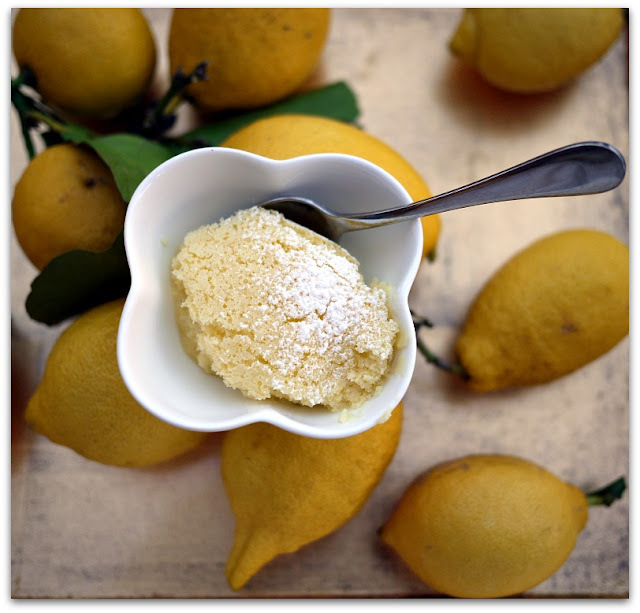 You can make this pudding with lemons or Meyer lemons with the same results. Sometimes I add 1/4 teaspoon of zest from a Keffir lime and it turns it into something more exotic. 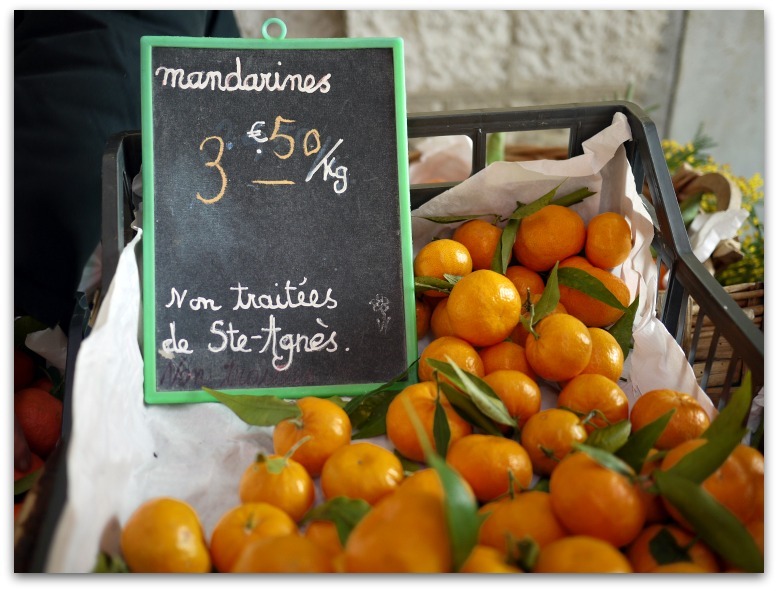 If you find lemons from Menton, definitely use them! 1. Preheat the oven to 325°F/175°C. Set your oven rack to the lowest level. Butter your baking dish or ramekins and set aside. 2. Put some water on to boil. You'll need enough boiling water to come up halfway up the sides of your baking dish once you place it in the roasting pan. 3. In a large bowl, mix together the butter, sugar, zest, egg yolks and salt until the mixture is smooth and uniform. Whisk in the lemon juice, flour and finally the milk. Set aside. 4. 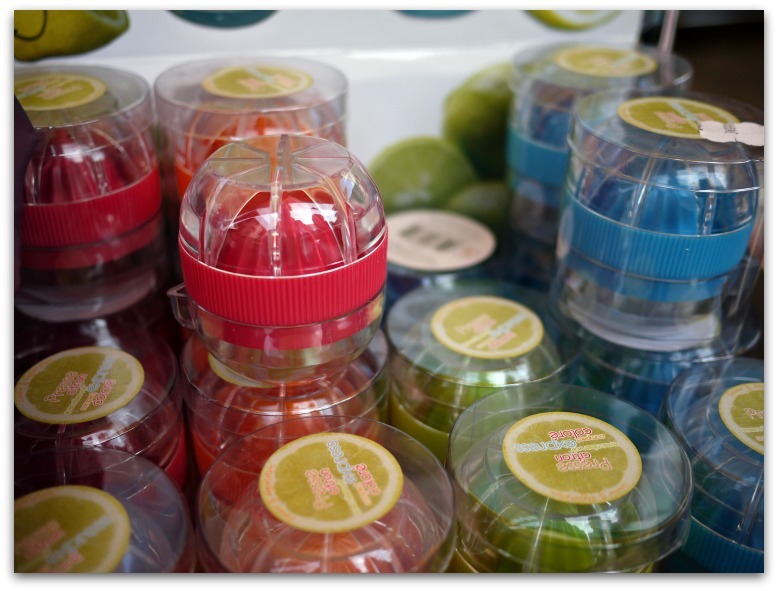 In your mixer or with hand held beaters, beat the egg whites until stiff but not dry. 5. Add the beaten egg whites to the first mixture and using a spatula, gently mix the two together. Use your whisk and whisk the mixture to make sure the egg white is fully incorporated and the mixture is uniform. The mixture will look curdled but that's OK.
6. Pour the batter into the baking dish or divide it evenly amongst the ramekins. 7. Place the baking dish or ramekins into the roasting pan. 8. Place the roasting pan into the oven and add boiling water to it to come up to half way up the sides of your baking dish or ramekins. 9. Bake for 30-35 minutes. 10. Remove the baking dish from the roasting pan. 11. Allow to the pudding to cool and dust with icing sugar before serving. I recommend that you place the baking dish or dishes in the roasting pan, put it in the oven and then add the boiling water. Carrying a roasting pan with boiling water is a recipe for burns! When the baking is done, remove the baking dish from the roasting pan and leave the roasting pan with the water in the oven to cool. If you need the oven and have to remove the roasting pan, do so after you've removed the baking dish. The water level will have lowered somewhat and be safer to remove. One of our favourite things to do when hubby and I visit Hong Kong is to spend hours at a time enjoying tea at a few of Hong Kong's traditional tea shops. It wasn't always so. 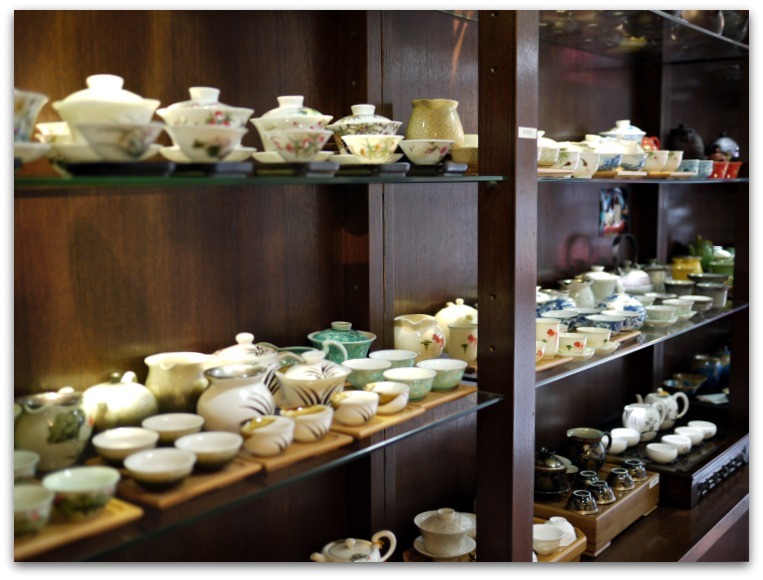 We got hooked on Chinese tea years ago during our first trip to Hong Kong when we hung out with our chef friend, David, who had an almost fanatical obsession with traditional Chinese tea ware. 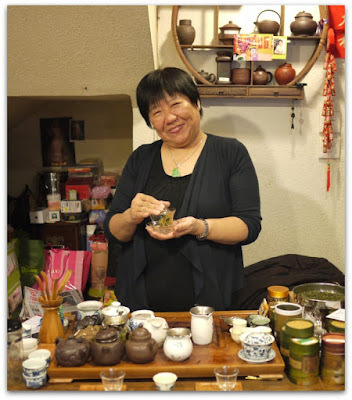 He brought us to his favourite tea house in Kowloon and after experiencing a congenial and gracious Gong Fu style Chinese tea tasting for the first time we were enthralled and hooked for life. Now we have our own favourite tea shops so as we've done for the past several years, today hubby and I took the MTR subway from Kowloon to Central and climbed the narrow, busy streets of Sheung Wan to Hollywood Road, a street mainly known for its art galleries and antiques shops. We were there to visit Virginia at the Hollywood Tea Gallery and taste her new teas. Her shop was the first of many tea shops we were to visit over the next two weeks. For a leisurely hour or two but what seemed to pass in a flash, we were hosted by Mrs Virginia Chien Kok Lan and treated to some interesting, complex, and delicious teas. Lucky for us she speaks English since part of the enjoyment of any tea tasting is learning all the details about the teas we're drinking. Hard to do in Hong Kong when the lingua franca is Cantonese. Even better, we share Virginia's taste in tea which makes for a pleasurable tasting and the key to a consistently fabulous supply of some of our favourite teas year after year. Her Da Hong Pao is hubby's favourite. 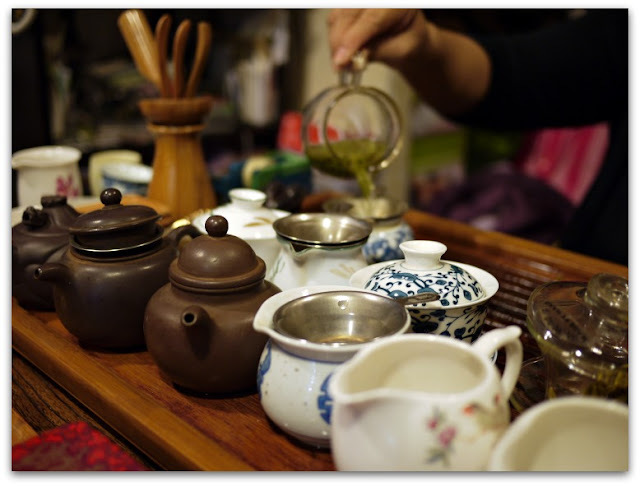 For anyone who has never experienced a Chinese Gong Fu tea service, rest assured that it's nothing at all like a Japanese Tea Ceremony which I found so complicated and ritualized that I was tense from start to finish. A Gong Fu tea service is a relaxed affair, mainly centred on the quality and characteristics of the appearance, fragrance and taste of the tea you're being served. Your job is to enjoy it, politely praise its virtues and enjoy cup after leisurely cup of it while engaging in pleasant conversation. 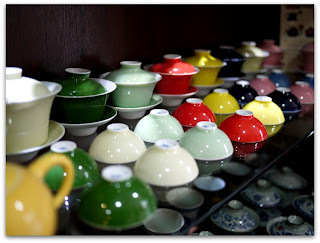 Depending on the type of tea, the host uses either a small, traditional Yixing clay teapot or a small cup with a lid, called a Gaiwan in which to steep the tea. One notable trait of Gong Fu tea preparation is that a large quantity of tea is used to make multiple infusions using the same leaves. This way, you can experience how the flavour of the tea changes after each infusion. 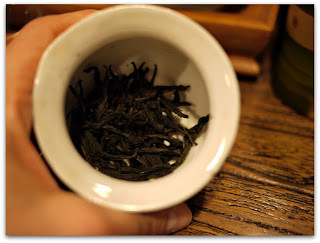 Some teas like dark, rich and earthy aged Pu'er from Yunnan are meant to be infused up to 10 times. During our first Gong Fu experience, the multiple infusions were explained to us in this way: the first infusion you experience the skin of the tea. The second infusion is the muscle. The third infusion is the bone. I'm not sure what comes after that but in our experience, it's usually a new tea and the process starts over. Luckily the tea cups are small, holding about 1 ounce of tea or about a shot glass worth. All the same, after tasting teas for an hour, at some point you'll need an exit strategy and a nearby washroom. 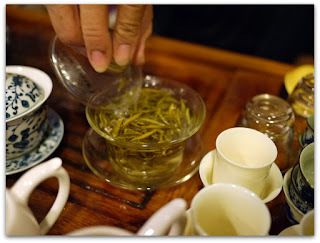 Bai Cha or Silver Needle. 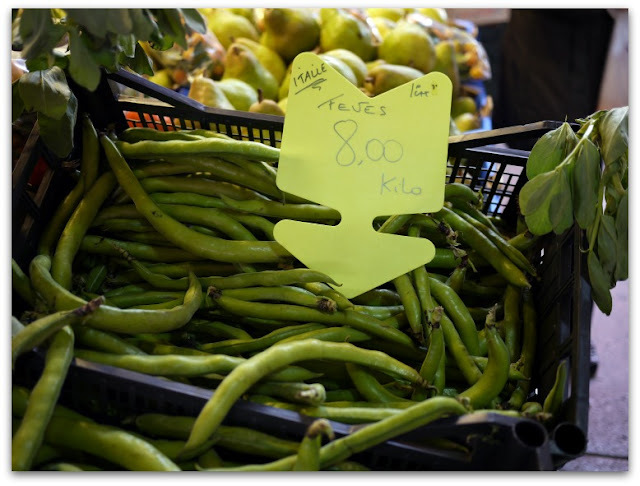 Fruity, light, and earthy. Long Jin or Dragon Well from near Shanghai. Floral and earthy. 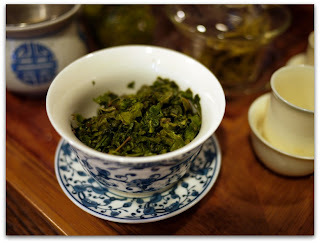 Da Hong Pao or "Big Red Robe," from the Wuyi Mountains in Fujian Provence. Rich cocoa and tobacco notes with a slightly bitter finish. Liu An. Tastes much like a Pu'er tea but lighter and less earthy. Milky Oolong Green tea with a coconut nose. Phoenix Orchid, like a feminine, lighter version of the Dao Hung Pao, with a blackberry finish. 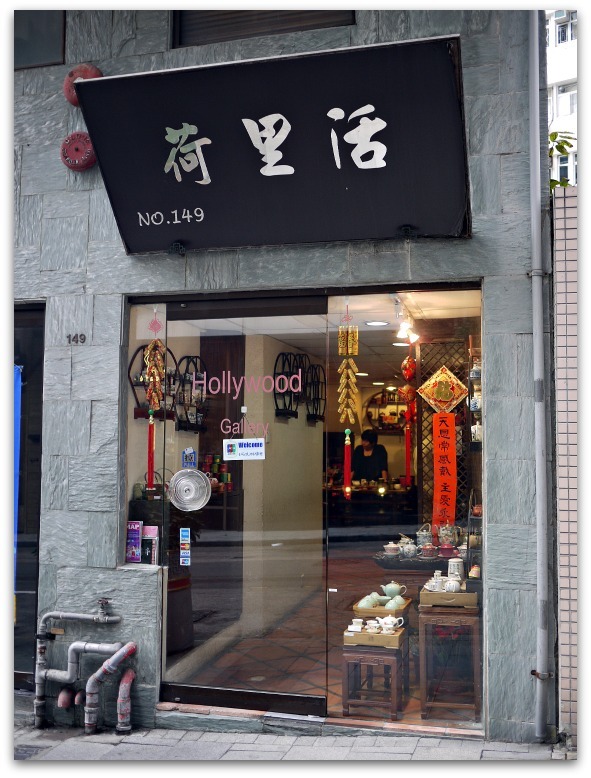 Sadly, we've lost touch with our friend David over the years and rely on his favourite tea house to pass on news but we're always grateful to him for having introduced us to the pleasures of Gong Fu tea. 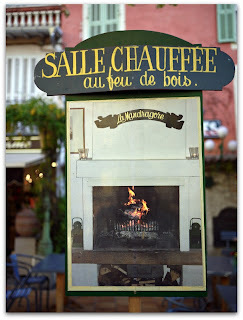 Last night, for the third time this week, the temperature here in Menton dropped to an unseasonably cold 3°c which kept most of the natives safely sheltered indoors, fearing for their lives and shivering under duvets. Not me. I'm Canadian and anything above freezing in the month of February is fine by me especially when my fellow citizens back home in the Old Country are in the midst of a -16°c winter weather cold snap. Gratitude is an attitude. Have your citrus and squeeze it too. 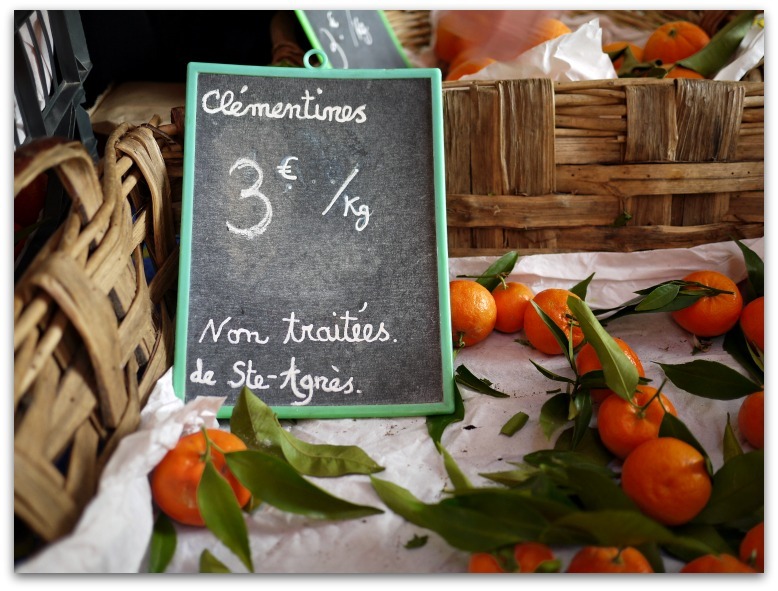 Everywhere in the Menton market this morning, the cold weather and last week's snowfall was the hot topic of conversation with cries of "Oh la la" this and "mon dieu, il fait froid" that. Everyone was bundled up in puffy coats, gloves and scarves, consoling and praising each other for bravery in the face of such hardship. Even my favourite Vendeuse from nearby village of Gorbio was wearing a fur hat for the first time ever. She, however, was not complaining. What I found amusing was that amidst all the talk of the cold, wind, and snow, we were surrounded by such fabulous things to eat. Mandarins, lemons, oranges, lettuces, spinach, broccoletti, artichokes, fava beans, and coco blanc to name a few, all produced locally. An embarrassment of edible riches. Seizing the opportunity, someone was selling nifty, mini, plastic, citrus presses to tourists so after they bought their local citrus they could make juice in their hotel rooms and avert catching colds. After tossing back a quick cup of hot tea, I lugged my grocery cart, heavy with all the goodies, up the hill home and that effectively kept me from noticing the cold. 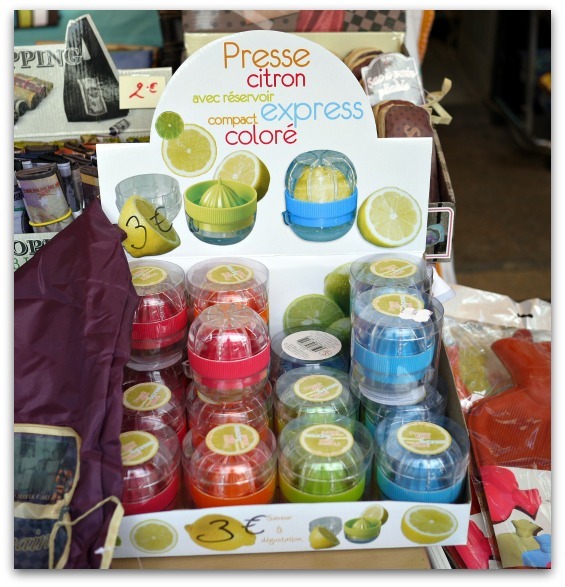 One thing's for sure, retailers here have their gloved fingers crossed for warmer weather; in two short weeks Menton's tropical Lemon Festival starts.